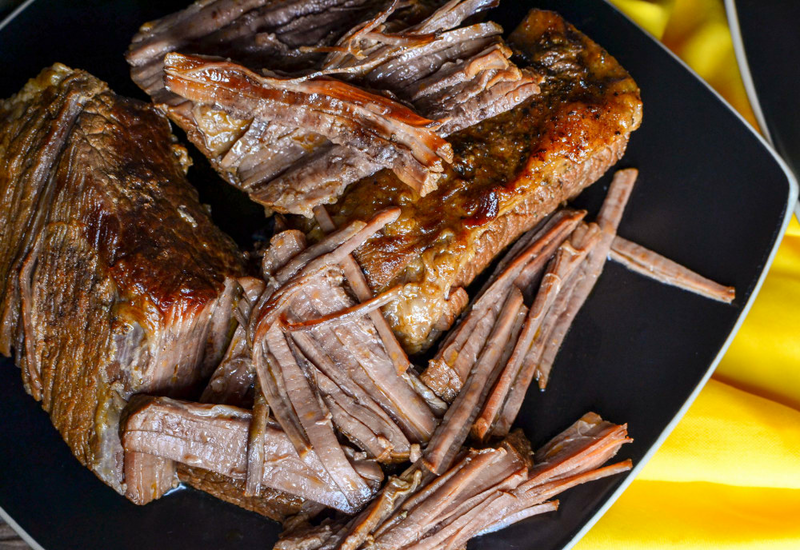 Our pressure cooker recipe for tender, juicy beef brisket is prepared with a flavorful homemade rub. What would traditionally take hours to tenderize and cook is ready in just over an hour in the MultiPot Pressure Cooker. Black pepper, salt, paprika, chili powder, garlic salt and onion powder come together in the brisket rub. If you have a favorite blend, give that a try instead! You can even turn this succulent dish into brisket sliders by serving them on top of small buns with a store-bought or homemade coleslaw for crunch. Brisket is normally tough cut of meat, due to the collagen fibers that make up the connective tissue in the cut. However, as this collagen breaks down in the cooking process, the meat is tenderized, resulting in more delicious brisket. If you prefer a firmer texture, similar to a smoked brisket, cut cooking time by 10 minutes. Here's a look at more Pressure Cooker Recipes. Per Serving: 830 calories; 52g fat; 2.4g carbohydrates; 82g protein; 301mg cholesterol; 1082mg sodium. I love a low-prep/effort recipe that my kids will eat. Ignore that they will put some mixture of ketchup, barbeque sauce, and mayonnaise on pretty much everything. This comes out tender and tasty enough to eat alone. Would go well with, say, Yorkshire puddings, but I was being lazy and did mashed potatoes instead. I put the brisket on Hawaiian-style buns and made sliders. Solid recipe, although the meat was very tender and sort of reminded me of a pot roast. Still, I will definitely make this again. Very good, and much quicker than cooking on a grill or smoker. Delicious brisket that is seasoned well! Perfect to serve with baked beans for a BBQ style, or even with taco shells. I used beef stock instead of water for added flavor. This brisket was so good! I ate it with barbecue sauce and a side of macaroni and cheese and mashed potatoes. It's hard to find a good brisket recipe that turns out tender and not dry. This is a must have in your recipe repertoire! Used beef broth instead of water when making this brisket. For a complete meal I did beans with mac and cheese. I also left it in there until the pressure fully released naturally so it would be really moist and tender. Great flavor, but with the massive amount of grease and a cup of water the meat boiled while swimming in too much liquid resulting in the need for another hour of cooking time. Simply delicious!! So quick and moist. Served it on a bun with a side of veggies. Would say however, way to much pepper. Next time I will use a teaspoon of pepper instead of a tablespoon. Flavor was great but our brisket came out pretty tough and looked nothing like the photo. Will try again, but kind of bummed!